RRB JE admit card 2014 - Download Railway Recruitment Board Junior Engineer Call Letter - Railway Recruitment Boards had invited applications via Advt. CEN No. 2/2014 from eligible candidates for the posts of Junior Engineers. The last date to apply for this recruitment was 19 October 2014. The application process was successfully completed for the posts of JE Depot Material Superintendent Chemical & Metallurgical Assistant. Now RRB is in the preparation for the written test which is scheduled to be held on 14 December 2014. The latest news is that those candidates who had applied and eligible, can download their RRB JE exam admit card 2014 from the direct link given here. Call letter Release date - 02 December 2014. Below is the list of RRB websites.Official website of Railways The hall ticket is available for download at the date given above. Railway Recruitment Board had released call letter for written test. Candidates can download their RRB Junior Engineer ( JE ) Admit card 2014 from the direct link provided above once they are released. Huge number of candidates had applied for these posts. Also note that no hard copy of call letter will be sent to any candidate by the board. They have to download it from official website. The direct link for downloading is given above. Candidates will be notified by this page after release. After the call letter gets released, candidates can download them by visiting the direct link given above. On that page, candidate need to find RRB JE Admit Card download link. 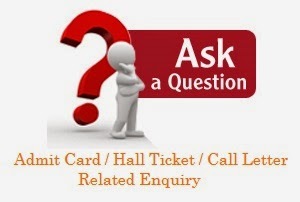 After the admit cards will be uploaded to the official website, you will see that link. Then, You have to enter registration details and then you will be able to download it. Aspirants will find all details regarding exam center, roll number etc. mentioned in that. After they gets released around 02-07 December 2014, candidates can download their RRB JE Admit Card 2014 from above link. Extended dates for J & K and Jharkhand - JE Group Exam - 04.01.2015.